The layer mask is a very powerful, time saving and useful tool to select, isolate, and extract images from a painting that has been placed on one layer in Photoshop. By using the layer mask with other tools and methods, images can be accurately isolated from backgrounds even if they contain fine detail such as hair, fur, and leaves. Multiple paintings can be combined into a single image by hiding portions of the layers to reveal the layers below, backgrounds can be changed without permanently erasing the original painting, and colors can be easily altered. At first glance, using the layer mask seems difficult but in reality it is simple. But first, a person needs to understand how layers and masks work in Photoshop. View the following elementary but unfortunately boring video tutorial "Photoshop Tutorial #3 - Masks & Layers Essentials" to learn how to use them. Note: The video shows a bonus tip on using keystrokes and the mouse to unlock the background layer (Mac = option key + double click mouse on the layer; Windows = alt key + double click). Layer masks are edited with brushes or selection tools. In the layer mask the areas painted black are hidden, the areas in white are visible, and areas painted in shades of gray appear in various levels of transparency. Layer masks are nondestructive so that they can be re-edited or deleted without losing the pixels they hide. Photoshop CS5 has two tools for masking. The quick mask is located at the bottom of the tool bar (rectangle icon with a circle in the middle). Use the keystroke Q to toggle it on and off. The quick mask can be used to select areas to be removed or moved to another layer instead of using the magic wand, marquee or lasso tools. It works well for selecting images but the layer mask (also available in earlier versions of Photoshop) should be used if the artist wishes to preserve the original image and have the opportunity to later re-edit the mask. The layer mask is located at the bottom of the layers panel (rectangle icon with a circle in the center) or open the mask panel under Window / Masks in the Photoshop control bar at the top of the window. Below are a few ways to use the quick and layer masks to enhance and edit art. Sometimes images from scanned art need to be extracted from the rest of the art to use them for patterns and additional art for collections. An easy, fast, and accurate way to do so is by using the quick mask and the layer mask. 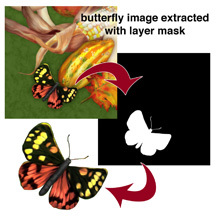 The picture at the top of this article illustrates extracting a butterfly from art by using the layer mask. To make it easy and fast to mask the background and extract the butterfly, the butterfly was masked by using a black-colored and small sharp-edged brush. Then the mask was inverted so that the area around the butterfly was masked leaving the butterfly unmasked. I find that using layer masks a better method in extracting images than the magic wand or other tools because the outline of the images are smoother with no jaggies. To see other methods in extracting images beside and including using masks, read "Photoshop Tip: Four methods to Extract Images/Icons from Scanned Art." Also view "Photoshop Tutorial: Make Selection With the Quick Mask" video to see a demonstration on using quick masks. And view "Tutorial Photoshop CS5 Layers and Masks Exercise" video to see a demonstration on using layer masks to isolate images on multiple layers to create a different picture. Using the layer mask on alpha channels work well in extracting more difficult images such as fine hair. View "Photoshop CS5 Tutorial - Introduction to Alpha Channels and Layer Masks" video to learn how. Note: I found this video very informative and the result absolutely amazing. Masks can be use to isolate a portion of the image on the layer. That way colors can be changed only to the masked portion and not to the entire image. Read "Photoshop Tip: Six Ways to Replace Colors" for information and links to videos demonstrating how to change colors using masks. Using several Photoshop tools including masks can simplify the repeat process when creating patterns. Read "Creating Repeat Patterns with Photoshop, Illustrator and Artlandia Plug-in Software" for information and links to videos. To create collages sometimes the edges of the images would look better if the they blend into one another. This can be easily done with the gradient tool and layer mask. View "Blending Two Photographs Together in Phototoshop - Using Mask" video to see how easy it can be done. The above are only a few examples on how masks can be used to edit art. I hope that they will save you time in extracting images and icons, combining them into new art for collections, and inspire you to create some amazing backgrounds. I welcome any comments. Please click on comments section at the bottom to write your comment. You may or may not know what QR (quick response) codes are but the use of them to market, sell products, and manage companies are gaining momentum in the United States due to increase usage of smart devices and the availability of QR decoders. It has taken the U.S. a while to catch up with Japan because Japan has been using them for over 15 years. Denso Wave a subsidiary of Toyota invented the QR codes in 1994. So what is so cool about QR codes and how are they used? QR codes are similar to bar codes in that they contain data but unlike bar codes that are one-dimensional and can only hold 20 numbers, QR codes are two-dimensional and can hold thousands of alpha-numeric characters and instructions to activate applications. By using a smart device* that has a QR decoder app on it, a person can scan a QR code and it automatically links to the internet, activate e-mail, make a phone call, or connect to a web browser depending on the data encrypted in the code. Of course, the device must possess the features to allow it to do so. For instance, a QR code phone number will place a call if it is scanned with a smart phone but will not if scanned with an iPad2 because an iPad does not have a phone. Note: There are other bar codes similar to QR codes such as Microsoft Tag but they are not as prevalent as QR codes. * A smart device has a camera, touch screen, and can connect to the internet, e-mail provider, sometimes a telephone provider, and web browser. It can be a smart phone (iPhone, Android, etc. ), iPod touch, iPad2, etc. Japan uses QR codes to download content from the internet, logistics in manufacturing, passports, ticketing at train stations, staff rosters, look up nutritional information, tracking inventory and much more. In fact, the uses of QR codes are evolving so fast that it is hard to keep track of them. For instance, realtors in the U.S. are using QR codes on real estate lawn signs to provide additional information about the property. Read "The 5 Best Ways to use QR Codes for Real Estate." QR codes are used in South Korean subways to make grocery shopping less painful for busy consumers. Read "Grocery Shopping via Smartphone on South Korean Subways." And Delta Airlines give passengers the option to download a QR code boarding pass to their smart phone. Read "Delta Electronic Boarding Pass = WIN." 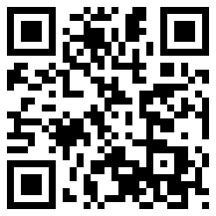 Also read the following articles for additional ways QR codes are now being used and suggestions on how they could be used. • "How Companies Can Use QR Codes to Enhance The Customer Experience"
• "13 Creative Ways to Use QR Codes for Marketing"
• "50-COUNT 'EM, 50! - CREATIVE USES OF QR CODES"
1. even though QR codes can contain thousands of alpha-numeric characters, having too many may cause dropped characters and make the code unreadable. This especially true when the QR code is printed small. 2. QR codes that are printed small for business cards and on advertisements may not be readable by all smart devices. I tried to read a code from an advertisement with my iPad2 and it would not scan. Most likely the resolution of the iPad2 camera is not good enough to read small QR codes. 3. In certain locations (convention centers and underground subways) using QR codes is not effective because of poor or no signal to the smart device. There are many free and low cost QR code readers (scanners) available on the internet. I have used QRset (free from iTunes store), Scan (free from iTunes store), and QR Code Reader HD ( $0.99 from iTunes store) on my iPad2 and all worked fine when the QR code was printed large enough. I do not own a smart phone so I could not test QR code apps for it. And for those of you that want to have a QR code that links to your website, blog or other social media sites, there are many internet sites that easily generate them at no cost but some are only for non-commercial use. As a test, I used Kaywa.com to generate a QR code that links to my website (see the QR code graphic at the top of this article). Smart device users, scan the QR code and see that it works! If you would like to add some pizazz to the look of a QR code, you can customize it. And if it is done right, it will still link to a site. Check out customize QR code examples on Google. I am not too sure how useful QR codes are for marketing art in the licensing industry because marketing via websites, social media sites and e-mail is now more prevalent than with print media. Of course, all printed marketing material (business cards, flyers, tearsheets, postcards etc.) can have QR codes linking to the different artist sites or using QR codes in signage in trade show booths as reported by Country Business Magazine. Although, many trade shows do not allow smart phones on the show floor so using QR codes in a booth is not really feasible. If you read the articles posted above, you will find that there are more effective ways in using QR codes than just linking to sites. Enhancing customer experience seems to be a good way to attract clients attention. But to do that in art licensing you need to be innovative and think out-of-the box. Any ideas and suggestions? If you do, please share them in the comments section to this post. 1. Laurel Lane's comment on how she is using Microsoft Tags to enhance the customer experience in a children's cookbook. 2. How Fiona Cartolina is using QR codes in her line of greeting cards. 3. How Brenda Boles is planning on using QR codes to advertize her art studio. Last March and April, there was a lot of hoopla when Google dropped the use of QR codes from their site and instead advocated the use of NFC (near field communication) chip technology in smart phones. Read "Google Kills Off Those Little Square Codes You Scan With Your Phone." Because Google is so powerful, does that mean the demise of QR codes? Not everyone thinks so! Read " QR Code Will Live on." And now Google is not abandoning QR codes after all. Read "Are QR Codes About to Hit the Mobile Mainstream?" Ah, the ever changing direction in technology. I guess we will just have to wait and see what happens to QR code usage. I welcome any suggestions and comments. Please write them in the comment section below. The U. S. Copyright Office "recommends" that the word copyright ( or copyright symbol ©) followed by the date created and then followed by the name of the creator be placed on all tangible work (i.e. art). They state that the "Use of the notice may be important because it informs the public that the work is protected by copyright, identifies the copyright owner, and shows the year of first publication. Furthermore, in the event that a work is infringed, if a proper notice of copyright appears on the published copy or copies to which a defendant in a copyright infringement suit had access, then no weight shall be given to such a defendant's interposition of a defense based on innocent infringement in mitigation of actual or statutory damages, except as provided in section 504(c)(2) of the copyright law." However, it is not required to place a copyright notice on art because once the art is created the copyright exists. Note: It is a good practice to register copyrights at the Copyright Office for all art if an infringement suit needs to be filed in court so that attorney fees and statutory damages may be collected. Read more about copyrights by downloading "Copyright Basics" from the U.S. Copyright Office (Library of Congress) website. Artists that license their art usually place the copyright symbol and signature on their art but most do not put the date. The reason is that the art could have been created years before it was licensed and the artist wants it to be perceived as fresh and new and not out-of-date. Some artists paint the copyright symbol and their signature on the original art before scanning it and saving in Photoshop. Others, first scan the art or individual icons / images and then place the copyright symbol and name (or signature) on the art in Photoshop. The symbol and name can be typed with a font, written with a stylus on a graphic tablet, or even created as a Photoshop brush. Read "Photoshop Tip: How to create a customized signature brush." I think a © signature should be visible without detracting from the art. But sometimes it is difficult to make it readable if the background is multicolored, has both a light and dark background, or is on a busy background. Hint: When using Photoshop to adjust the visibility of the signature, always place the signature in a separate layer with no background color. Read the following examples on how to use Photoshop to make a signature readable. • Any color can be used for a © signature. I tend to use a hue that is darker than the background if it is a light color. On dark backgrounds I use a light color for the signature. In the example at the top of the article, #1- signature is displayed in white and #3- in black. Obviously the #3- signature is too dark on such a dark and busy background and cannot be seen clearly. I think that the signature in #1- stands out too much and will detract from the art. Signature #2- was originally white but the opacity of the layer was reduced to 60% so that the background colors show through. To me, the signature is much more acceptable and still readable. Hint: Adjust the opacity of the signature layer until you get the effect you want. 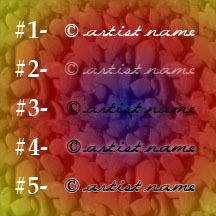 • Another method to make the signature standout on a mixed light and dark or a multicolored background is to place a glow around a darkly colored signature as shown in signature #4-. It can easily be done by going to Layer / Layer Style / Outer Glow. Adjust the opacity, color of glow (light yellow is default), spread and size of the glow. In example #4- the opacity of the glow is 40%, the color is light blue, the spread is 16% and the size is 84 px around the black signature. • Example #5- has a white outline around the signature letters. Go to Layer / Stroke and adjust the size, position of the stroke, opacity, and color. In the example, the size is 7 px, the stroke is on the outside, the opacity is 50%, and white color. Note: I think the outline detracts from the readability of the signature but you might like the effect. Make sure that you place a readable copyright notice on all your art before displaying it on your website, using it in marketing materials, and sending to manufacturers for licensing consideration. Also place the copyright notice on your art when sending the final version of the art to the licensee. 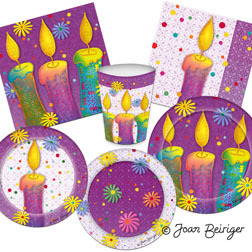 Usually they will print the art on the product with the copyright notice on the art. But if they plan to place the copyright notice elsewhere on the product (i.e. on the salvage for fabric or on the back of a greeting card), they "may" ask you to remove it from the art. Read "art licensing question - do you sign your artwork for licensing" on artist Linda Tieu's blog to see other artist opinions on signing their art.